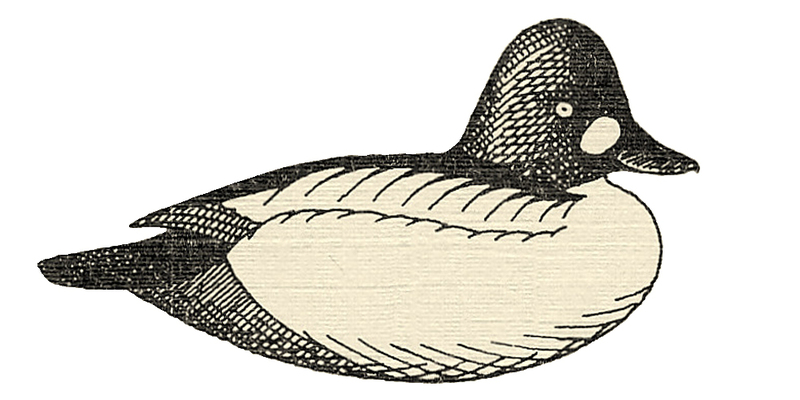 I drew this Drake Goldeneye sometime in the early 1980s to be used as a logo on my first business card. I selected this picture because it represented a “breakthrough bird” in my carving. 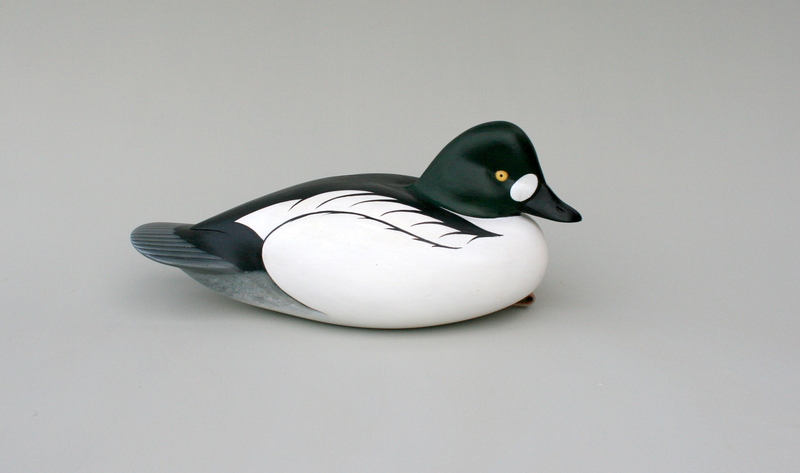 I have always thought the Goldeneye – “Whistlers” to those of us who hunt them in the ice of Great South Bay – was something special. 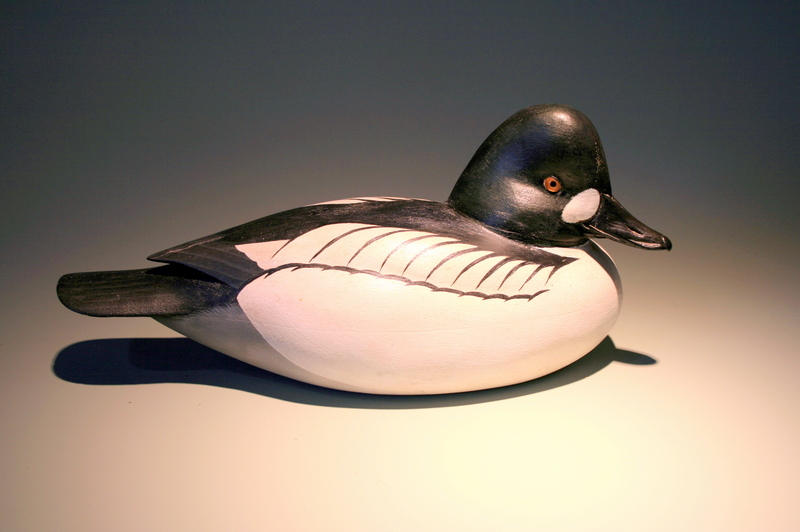 I recall reading how bird artist Roger Tory Peterson regarded the species as the most beautiful bird he had ever seen. The drakes especially have a real commanding presence when seen up close, with their bullheaded crown and those egg-yolk yellow eyes. I struggled to draw and later carve them since I was very young. I finally came up with this profile and found that it conveyed the same feeling to me that the live bird did. This is a typical decorative bird – intended for the mantelpiece or bookshelf but probably not to see service in anyone’s rig. I enjoy painting the drake divers because I enjoy what I call a “diagrammatic” paint job. I strive for bold contrasts, geometric shapes, and fair curves. 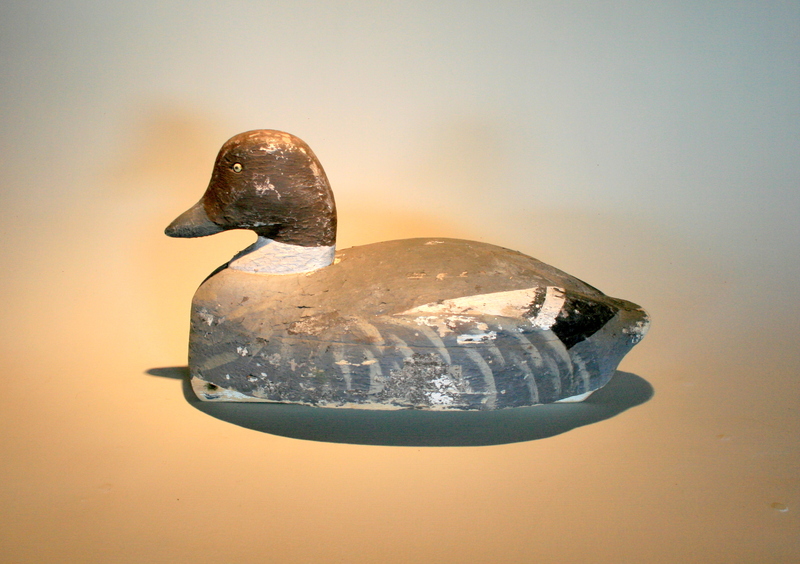 I think of classic decoys by Joseph Lincoln and Lee & Lem Dudley when I carve and paint these divers. 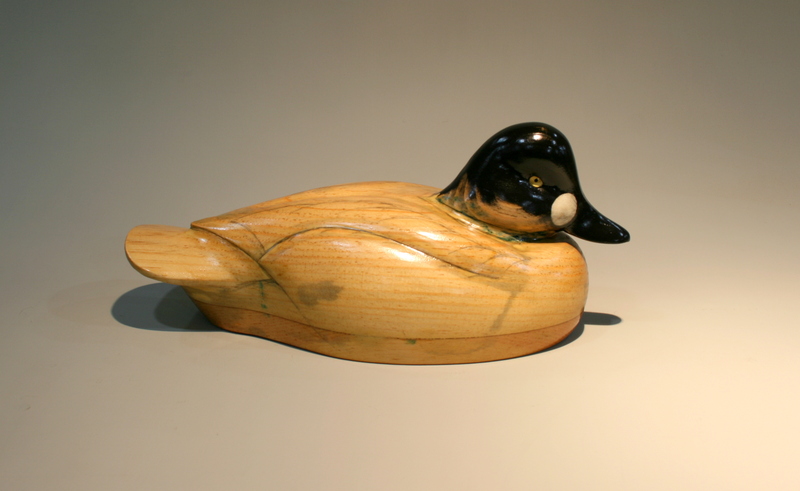 The Whistler above was the first one I carved from my new pattern in the early 1980s. Actually, I was doing it as a commission. I liked it so much, I quickly did a second one for delivery so I could keep the original for myself – I still have it. I used it along with one of my cork Black Duck decoys for a promotional photograph to accompany the press release for the 1994 (?) Duckboat Show & Waterfowl Festival – the South Shore Waterfowlers event which I ran for several years. The photo was used in Long Island’s two largest papers – Newsday and Suffolk Life – and drew in many more attendees than previously. The Show turned its first large profit that year (my last in lead role because I moved upstate later that year). I carved this gunner in 2013. I made it for my own “saltwater” (Long Island) rig and also to compete in the gunning contest at the Clayton show (Thousand Islands). Alas, all of my wooden gunners were disqualified (I may have set a DQ record….) because of the way I cut in the primary group. (The finished bird, of course, has a ballasted keel so the bird self-rights.) 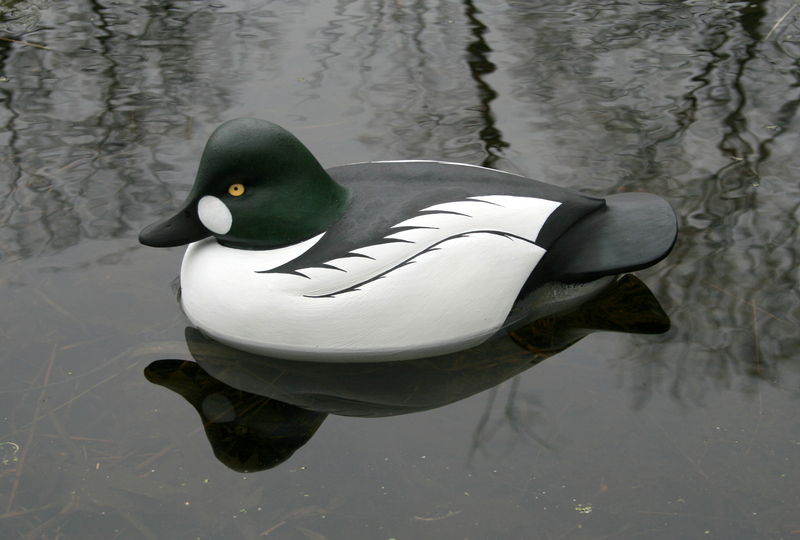 Later in 2013, I contributed this decoy to the “Traveling Decoy” event run by the fine folks at duckboats.net. Because its season-long journey was to begin the in Upper Peninsula of Michigan – and because of the species’ regal bearing – it was dubbed “Lord Yooper” by the participants. 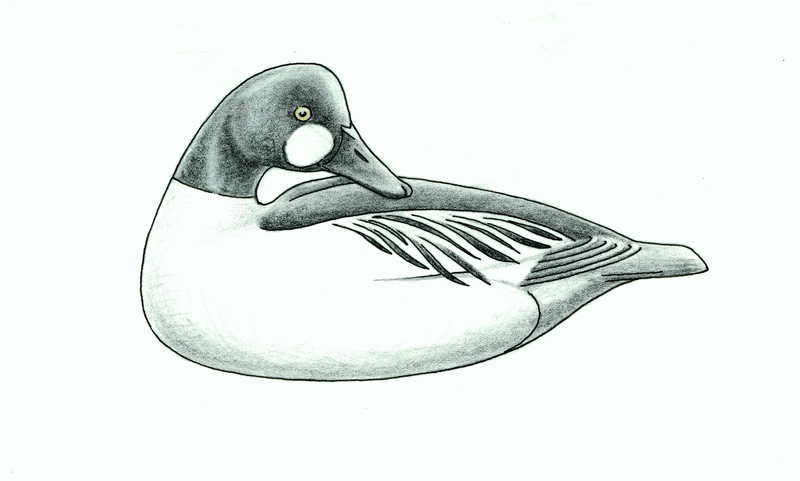 I drew this “Turnback Whistler” after the Shang Wheeler decoy. I worked from a painting that was part of a calendar series – my Dad bought the set of prints. It caught my fancy then – age 13 or 14 – and still does. 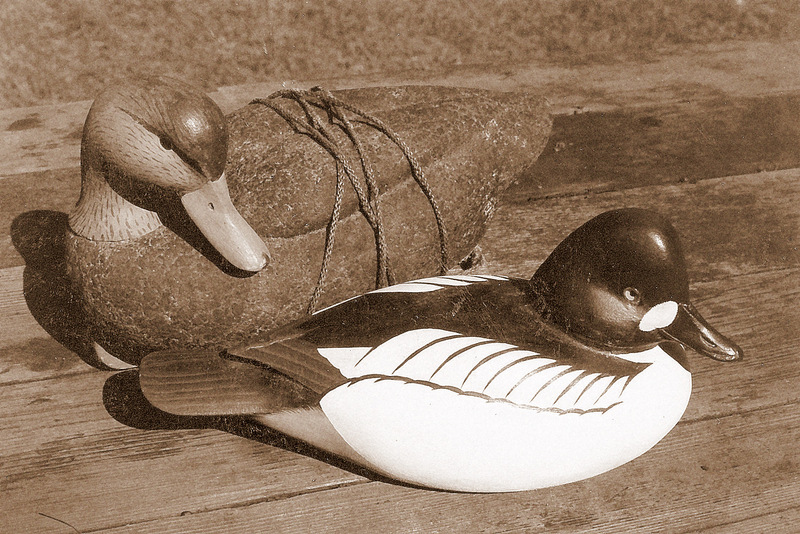 This pair of Whistlers began life as Herter’s Model Perfect Bluebill decoys. The bodies are of balsa – Herter’s signature “Hard Santa Marta Balsa” – and had slightly longer bills in the late 40s or early 50s when they were made. My Dad had 7 of these. While still in high school, I “converted” them to Goldeneyes at my Dad’s request. We did a lot of open-bay gunning from our scooter and always saw plenty of Whistlers, especially when there was ice around. 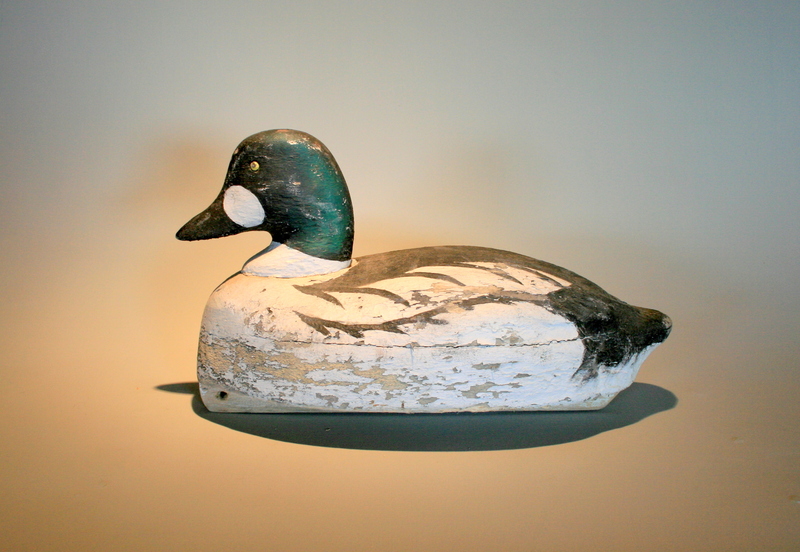 So, I took a rasp to the bill and then changed their plumage with paint – I used Herter’s Decoy Paints back then. I re-painted them in the mid-80s. That is when I added the ballasted keels – the original birds had flat bottoms and no ballast and so would flip over in a heavy chop.